8 spots go into the end of the month free case random! 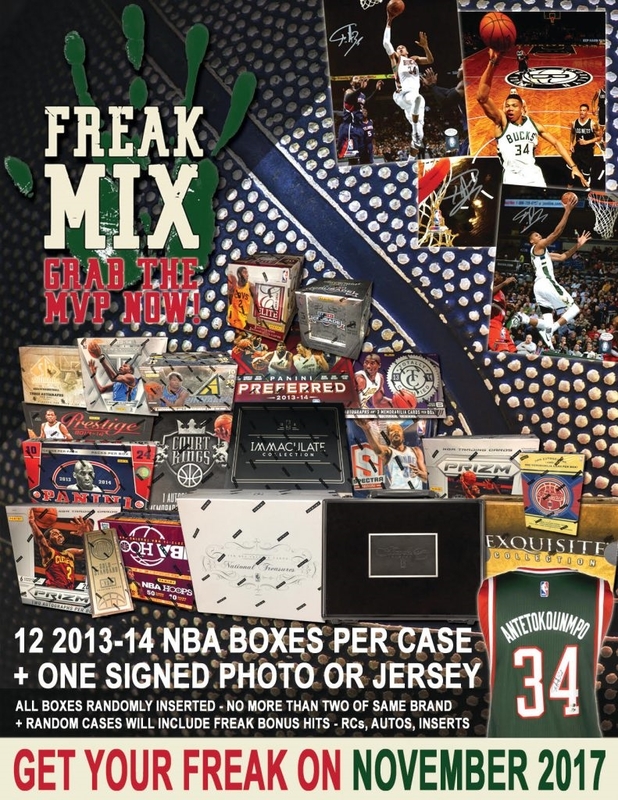 2017 Freak Mix NBA Basketball Cards delivers (12) 2013-14 Sealed Panini Hobby NBA Basketball Boxes PLUS (1) Giannis Antetokounmpo Autographed Photograph or Jersey in Every Case!Random cases will include FREAK BONUS HITS – RC’s, Autographs, Inserts, etc. (12) 2013-14 Sealed Panini Hobby NBA Basketball Boxes PLUS (1) Giannis AntetokounmpoAutographed Photograph or Jersey in Every Case! Chase BIG HITS from the 2013-14 NBA Rookie Class including: Giannis Antetokounmpo, Michael Carter-Williams, Victor Oladipo, Trey Burke, Tim Hardaway Jr., Nerlens Noel, CJ Mccollum , Dennis Schroder & MANY MORE!! Look for PREMIUM Hobby brands from Panini America’s NBA portfolio including: National Treasures, Immaculate, Preferred & MORE! 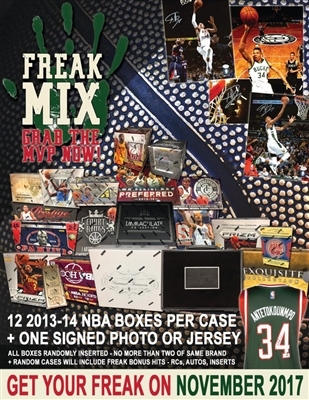 Random cases will include FREAK BONUS HITS – RC’s, Autographs, Inserts, etc.